As it turned out soon after closing yesterday's blog entry The Chef and I agreed that we didn't want to stay on the freebie car park and risk the Neanderthals kicking off with their noise and music and decided to move on. It didn't take too long to prepare the vehicle and then we were away. The satnav told me it was a three and a half hour drive to our next destination, but given that we set out at about 19:00 it was unreasonable to expect us to get there in one hit. 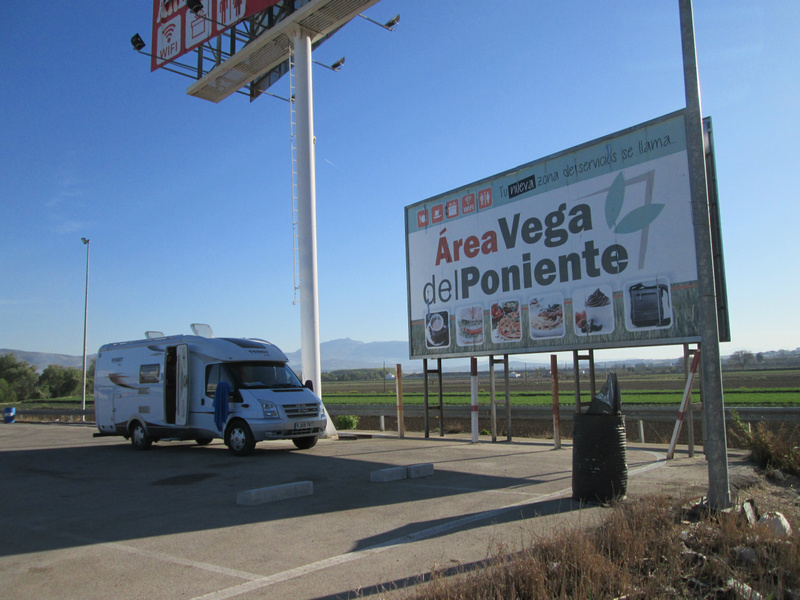 As it was, we did half the journey, stopping at a Truck-Stop just before we were to turn south towards Malaga. The journey was a little bit hairy as I had failed to dump my waste water before we set out. I had identified a suitable drain earlier in the day, but just plain forgot to do it. This meant I had more weight than I wanted at the rear, coupled with the problem of driving directly in to a bright, low setting sun, with a very dirty bug-encrusted windscreen, made worse by my trying to clean it with the wipers which resulted in my having a smeared, bug-encrusted windscreen. After the previous evening our overnight stay, was, by comparison, a very peaceful night. This morning we used up much of the remaining water by having a lovely hot shower. I did intend to have a wet shave under it, but having asked The Chef to pass me in my razor I forgot the shaving foam and so the effort was not entirely successful. The added bonus before we set off was that there was a drain close by and after a bit of manoeuvring I managed to get the grey water dump valve over the drain, and that was it - all gone. Off we went then, putting our faith in the satnav to take us to a campsite we had stayed at two years ago. In fact it was the first campsite of that trip, Camping Cabopino www.campingcabopino.com where we spent the month of December and found ourselves sunbathing on the nearby beach on Christmas Day. Anyhow to cut a long story short, it got us here, and somehow missed the Toll Road which then required us to drive though numerous resorts including Fuengirola, where, many years ago, we had our first introduction to a Medallion Man 'All Inclusive' holiday - but that's another story. On arrival The Chef booked us in for two nights. Our thinking was to get settled today, then tomorrow to be a bit of a chores day getting all the washing etc done. After that we were hoping to 'wild camp' for three nights down by the beach. We were lucky enough to bag a pitch from which a Brit caravanner was just leaving to go home. We are very happy with it, and even other folk walking round looking for a pitch have asked us if they could have ours. There were a number of empty pitches around us when we arrived but they have filled up as the day has progressed. It has been very entertaining 'people watching' as fellow 'camper's try to park their vehicles/caravans in their pitches. Two pitches down there is a an elderly couple who frankly should retire from caravanning. To watch them try and pitch was pitiful. With so much entertainment it was difficult to wrench ourselves away to walk to the beach and our potential freebie for three nights. A walk along the beach bought back memories, though this time it was far busier. Last time we were here was in December 2014, this time it's early April and a lot warmer. This time it was noticeable how many children there were about. Unfortunately this is the Easter holiday season, and I read on the internet that as from today, over the next three weeks all Spanish school kids get a week off school. So it looks as if we are going to be plagued by the little sods one way or another for the next three weeks. After a nice wander around the small marina complex with its bars and restaurants we made our way back. I remembered how, two years ago we could have had our Christmas Dinner at 'Albert's' restaurant in the marina but, including drinks and tips, it would have cost us over £150 and so we didn't bother. Back at the pitch the entertainment continued. There was a French couple in a motorhome who have parked almost across from us whose behaviour was most peculiar. Their electrical hook-up wiring arrangement looked quiet Heath Robinson, on top of which they were intent on burying the cable with gravel, including gravel nicked from other pitches. Then they covered that with a plastic camping mat. The best was the satellite dish arrangement. The dish was attached to a tripod. The tripod was attached to the rear of the vehicle, and the tripod was stood on a kitchen table which had wooden blocks on it to keep the tripod level. This is in spite of having an automatic satellite dish mounted on the roof. I swear we are sharing our lives with the Spanish Fuckwits Camping Club. Then we add the German couple who arrived with a great big Class 'A' motorhome, so big it has had to be put in the pitch at an angle to make it fit. Out pops 'mummy' with her furry rat under her arm. This 'dog' if you can call it that, didn't yap or anything. It just spent it's time being held by 'mummy' or sat on mummy's lap whist she sat in a chair. Now some may think I have a thing about German female motorhomers, and they may be right. The majority of these women look truly scary. If you were to upset them they'd probably challenge you to an arm wrestling match or a bare-knuckle fight. They make our He-Dykes look feminine. Some may struggle with that suggestion, but I believe we must look beyond those crew cuts, tattoo's, multiple ear piercings, the bolt-through-the-tongue, the stainless steel bone through the nose, god-only knows what metalwork below the waistline, the denim and Doc Martin boots. For I believe if we do, we will discover someone who is more feminine than a German female motorhomer - well maybe. Following the disappointment regarding a few days of wild camping across the road we will be formulating a Plan 'B'. In the meantime it is chores tomorrow for starters.